If there is any axiom for home buying, it is that location is everything. Home prices flair up or down subject to factors that range from the convenience of mass transit in urban areas, one’s distance from highways in suburban ones, the availability of high-performing schools, access to natural beauty, cultural amenities, broadband service, a high-rise view and more. Because consumer demand drives land value in the residential market, the real estate industry translates visceral human response –“I love (or hate) this place”– into an “objective” home price (1). And few factors influence home price more than a listing’s proximity to violence. Given this, indulge me in a small bit of storytelling. On a hot July afternoon, along the major thoroughfare between a small, well-heeled suburb and a large Metropolitan area; a latino man in his 30’s becomes agitated at the sight of a black driver. The former closely tails the later, eventually forcing both cars from the road. The aggressor leaps from his vehicle and walks towards his target on foot. Adrenaline and cortisol course through his veins. He pays glancing attention to the shadow of a 4-year-old girl in a safety seat, strapped into the back of the black driver’s car. His hand hovers over the handle of a firearm, ready to draw and fire at a moment’s notice. Still behind the wheel, the black driver attempts to ease the tension, telling the aggressor of the gun in his glove compartment and warning against a violent encounter. But his pleas for sanity fall on deaf ears. Taking position at the front of the black driver’s car, the aggressor opens fire into the driver side window, shooting his victim in front of an adult woman passenger and her no-longer-innocent child. The wild and unprovoked shooting garners national media attention, and the once anonymous suburb finds itself infamous for a mounting trend in road-side homicide. A large body of literature within criminology tells us that home prices in the well-heeled suburb should react to this tragedy with a sharp downward turn. In a 2006 article published in Quantitative Criminology, George E Teta (et al.) assert that homicide, unlike other types of crime, most directly correlates with declines in home prices (2). Other studies indicate that homicide is particularly impactful in high-end neighborhoods where the rarity of violent crime draws an outsized media response (3). Nonetheless, in the year since officer Jeronimo Yanez shot and killed Philando Castile in Falcon Heights Minnesota, under nearly identical circumstances as I describe above, home prices in the St. Paul suburb rose at an impressive clip of 13%; the area’s most robust bull market since the sub-prime speculative bubble (4). Obviously, the fact that Yanez was a member of the St. Anthony police department at the time of the shooting differentiates my story from the sad reality of Castile’s death. But there’s a strong case that the real estate market should have put the brakes on Falcon Heights home prices. Diamond Reynolds’ widely viewed Facebook live video did not only make Philando Castile a globally trending hashtag, it brought unexpected infamy to Falcon Heights and subsequent Black Lives Matter protests threatened to further deteriorate the area’s desirability. Indeed, corporate actors across multiple industries often fret that recent attention to police violence and anti-brutality protest negatively impacts their bottom line. Earlier this year, “pro-business” legislatures in a dozen states debated versions of law that would charge activists with a crime should public protest drive revenue away from local business. Liability insurers are also concerned. Risk Management Inc. cancelled the Sorrento Louisiana police department’s liability policy after a series of pricey racial discrimination lawsuits made them too much of an insurance risk. Recently, a close friend who works in non-profit advocacy shared with me (on condition of anonymity) that insurers were unwilling to provide their organization liability coverage because of the “consequences” of “political involvement.” As one insurer put it, “you see on the news what’s going on.” Outside of concerns for personal safety, crime rates drive consumers away from a housing market because they place upward pressure on homeowner’s insurance rates and, undoubtedly, proximity to protest has the potential to do the same. And yet, in defiance of market logic and actuarial science, home prices in Falcon Heights only continue to rise. Why? I argue that Castile’s death is not a failure of policing or a constituent of crime anxiety. Rather, Philando Castile was killed by our obsession with growth, and in particular, the middle class’ reliance upon property values for economic security. His killing sent current and potential homeowners in Falcon Heights a clear message: The state, via the police, will protect the long-term value of your home against the stain of blackness. Rather than counterintuitive, the market response to this tragedy becomes predictable when contextualized within the history of blackness’ forced association with value depreciation. Interest in the many tentacles of the carceral state has driven the lion’s share of recent academic scholarship on the outsized power capitalism wields over black life (5). In her foundational book Golden Gulag, Ruth Wilson Gilmore describes how deindustrialization left populous states like California with surpluses of finance capital, land and manpower amidst a political turn away from redistributionist welfare policy. Rather than pursue universal basic income or full employment, California built prisons; and expanded the punitive power of the criminal justice system in order to fill them (6). The militarization of municipal police departments—so powerfully on display during the Ferguson and Baltimore uprisings—has strengthened the bottom line of private defense contractors at the expense of black suffering (7). Still, the disposal of black lives into the carceral machine is an adjacent, but different, historical phenomenon from the deep association between black visibility and property value loss. Prior to emancipation, black “hands,” as they were counted, functioned as both units of currency and unmatched labor power. Under the control of white masters, enslaved people increased the value of their families’ property portfolio. However, as Khalil Gibran Muhammad notes, after emancipation, sociological and actuarial expertise collaborated to frame black people as congenitally defective–destined for early death and eventual extinction. However methodologically unsound, this new knowledge donned the shroud of objectivity and was incorporated into the first private life insurance offered to black families. Needless to say, this early means of quantifying human potential consistently paid less capital to black families less than non-black ones (8). As American progressives brought scientific positivism to bear upon urban development, the earliest zoning professionals and planners mapped any neighborhood friendly to black people as a “blighted” habitat that threatened property values across an entire city’s “ecosystem” (9). The establishment of the Federal Housing Authority during the New Deal nationalized the production of risk-assessment maps—a mortgage lender’s guidebook to redlining—and put federal muscle behind the racial biases of urban planning science. Postwar federal urban renewal policy only made individual homeownership near black neighborhoods a riskier gambit, as local governments aggressively deployed eminent domain authority to acquire and demolish neighborhoods that stood in the way of “progress” (10). White homeowners took note, and took advantage of federal mortgage financing to escape into communities like Falcon Heights. These suburban safe havens were far removed from poor African Americans who found themselves without options; hemmed into subsidized housing within Metropolitan America’s most inaccessible geographies. So many of the black people who have lost their lives at the hand of the police—Oscar Grant, Rekia Boyd, Eric Garner, Alton Sterling—lost their lives in those same neighborhoods, because police have been empowered to treat poverty with deadly force (11). Philando Castile, though, was killed in the suburbs and as I mentioned at the start of this essay, location is everything. To apply the “broken windows policing” frame onto his death is to over-privilege the American inner city within our conception of a global relationship between blackness and value that manifests differently in each local context. More accurately, Philando Castile was killed at a number of crossroads. He was killed in transit, on Larpenture Avenue, a crossroads between St. Paul and a number of suburbs in Ramsey county Minnesota, including Falcon Heights. According to an NPR analysis of the geography of his arrests, he was traveling between St. Paul and Ramsey county suburbs during many of the dozens of times law enforcement saw and stopped him in the Chevrolet that would become his tomb. He was also killed in one of the most well-watched communities in the state. A 2011 Falcon Heights community brochure tells readers, their town was the first community in Minnesota to boast a member of the neighborhood crime watch on every block. In that regard, Castile’s death echoes Trayvon Martin’s; who was killed by neighborhood watch captain George Zimmerman. Most pressingly, he was killed at a major crossroads in American history; a moment defined in part by the middle class’ mounting reliance upon the whims of the real estate market for their own survival. If there is any utility in distinguishing between neoliberalism and capitalism, it is that the former term highlights the cultural and cognitive shifts produced by privatization over time. For example, as deunionization and governmental negligence has left more Americans without access to public or private pension programs, those same workers have been forced to rely upon home equity to maintain their standard of living in retirement. Many working and middle-class workers have a fiscal interest in land value as most 401ks allow employees to funnel their contributions into Wall street’s real estate index. White collar employers, like the University of Minnesota, have their own stake in metropolitan land markets as recruiters dangle the prospect of long term real estate investment in front of potential employees. Much in the same way that taxation, welfare and military service produce (however coerced) citizenship and national belonging, the real estate market demands its own form of tribute as a condition of the distribution of equity and retirement income. In that sense, the housing market wields a kind of sovereignty over American life, assigning positive value and the right to live to those populations who contribute to its strength and longevity, and demanding the expulsion–to the point of death to those who threaten the same. What we face, in short, is necrocapitalism. The Movement for Black Lives has generated the nation’s first popular conversation about the value of black life. Still, movement advocates tend to describe the police’s devaluation of black life as the state’s failure to recognize African American’s citizenship. Both the left and right’s focus on state agents’ behavior towards African Americans necessarily frames these debates in terms of citizenship. Police boosters claim that #bluelives engage and defeat “the thugs” bent on robbing us of our constitutionally guaranteed right to private property. Critics point out that programs like Stop and Frisk deny black and brown citizens’ due process and suspends their freedom from unlawful search and seizure. To ask if black lives matter, forces the state to account for its failure to protect the “natural right” to “life” black people are promised in the nation’s founding documents. Indeed, one could describe racially biased policing in the United States as an iteration of Achille Mbembe’s necropolitics. The ubiquity of police killings, the impunity which greets anti-black police violence, and the utter predictability of both reveal how often the American state rehearses its power to expose black people to death. But we must expand beyond Mbembe and the Movement’s concern with the unfulfilled promises of the nation and position Castile’s death as signpost of a necrocapitalist order. 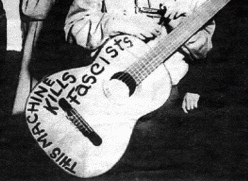 Necrocapitalism refers to a powerful contradiction churning at the heart of post-World War II capitalism. On one hand, decolonization, racial liberalism and globalization have produced, quite literally, a narrow pathway out of poverty for once subjugated populations. Here, the ascendency of integrationism in American jurisprudence, professional codes of conduct and popular culture has encouraged black people to attend schools and search for jobs in majority white territory. In turn, across post-colonial Europe, African, Arab, Persian and South Asian migrants flooded into cities built by their natural resources and in search of lifestyles made possible by their labor. In London, these economic refugees were often forced into illicit “hidden homes” (black market rentals carved out of abandoned commercial buildings) or publicly subsidized tower blocks. On the other hand, while multiculturalism has demanded more diverse Western labor markets, anti-blackness is still central to value assessment in global land markets. This means that liberalization drags black people into the very line of fire, figurative and literal. The 80 identified victims of the Grenfell blaze were not profiled by a police officer blinded by America’s unique history of anti-black racialization. But they, by proxy of their residency in a south London tower block, were similarly targeted for removal from public view. As Hip-Hop activist Akala told the BBC, the tenant management organization purchased highly flammable cladding for Grenfell as part of an aesthetic upgrade. For years, residents lobbied tenant management for funds to repair their building’s faulty electrical systems, and were met with a polite but firm stonewall. Those repairs would have had almost no impact on the building’s exterior—and by extension—the appearance of the surrounding neighborhood. Since the Tony Blair years, borough councils have strategized to remove the “eye sores” of tower blocks, as well as “hidden homes” from the urban landscape. More research needs to be conducted on south London’s hidden homes project, but a preliminary scan of media reports reveal that urban reformers hoped to help tenants “escape” exploitation by bringing them “out of the shadows” and “into the light of day.” These “regeneration” projects function similarly to urban renewal policy in the United States, displacing poor Londoners into various states of housing insecurity, including permanent homelessness. Once displaced, they are more vulnerable to attack from white supremacists, ill-health, street crime and police harassment. Though differently produced, Philando Castile’s death and the Grenfell tower tragedy were animated by the same economic order, one that requires black people to cross metropolitan and national borders to survive and countenances the removal of black life in tribute to value. In the wake of tragedy, pushes for reform have found new life. The English parliament is as focused on enforcing safety regulations in tower blocks as American city councils have been on forcing officers to wear body cameras while on patrol. Yet, as police killings continue and Grenfell survivors find themselves unable to trade sympathy in for permanent housing, a reform agenda feels like little more than wallpaper applied to rotting dry wall. What then, can we do? We must grapple, simultaneously and at a cognitive level, with how we understand blackness and how we assess value. There may have been a time when we could say that markets quantify our desires and reflect them back to us. But our coevolution with capitalism has progressed beyond that sort of linear, direct relationship. Now to oppose the devaluation of blackness is to oppose how markets assess value itself. Perhaps then, the only way to break free from a necrocapitalist order is to demand a society that rejects any coherent system of value assessment. One that makes space for diverse and multiple modes of living; rather than demanding market territory for each identity category. Doing so may allow black people to choose whether or not it’s worth the risk to travel through any geography where the free market’s deadly logics are so densely concentrated. Here I am in conversation with Eva Hageman’s dissertation, “The Lifestyle: Economies of Culture and Race in Reality Television,” NYU 2016. George E. Tita, Tricia L. Petras, Robert T. Greenbaum, “Crime and Residential Choice: A Neighborhood Level Analysis of the Impact of Crime on Housing Prices” Journal of Quantitative Criminology. Joel Best, Random Violence: How We Talk About New Crimes and New Victims (University of California Press: Berkeley, 1999). Data drawn from Zillow.com on June 29, 2017. Recent exceptions include, Keeanga Yamahtta-Taylor From #Blacklivesmatter to Black Liberation (Chicago: Haymarket Books, 2016); David P. Stein “This Nation Has Never Honestly Dealt with the Question of a Peacetime Economy”: Coretta Scott King and the Struggle for a Nonviolent Economy in the 1970s” Souls 18, 1 (2016); N.D.B Connolly, A World More Concrete: Real Estate and the Remaking of Jim Crow South Florida (University of Chicago Press, 2014); Devin Fergus, “The Ghetto Tax: Auto Insurance, Postal Code Profiling and the Hidden History of Wealth Transfer,” Beyond Discrimination: Racial Inequality in a Postracist Era (New York: Russel Sage Foundation, 2013). Ruth Wilson Gilmore, Golden Gulag: Prisons, Surplus, Crisis, and Opposition in Globalizing California (University of California Press: Berkeley, 2007). Elizabeth Kai Hinton From the War on Poverty to the War on Crime: The Making of Mass Incarceration in America (Harvard University Press, Cambridge, 2016). Khalil Gibran Muhammad, The Condemnation of Blackness: Race, Crime, and the Making of Modern Urban America (Cambridge: Harvard University Press, 2011). David Freund, Colored Property (Chicago: University of Chicago Press, 2007). I refer here to a significant literature in urban studies, but on the psychic trauma’s left behind by urban renewal. I most recommend Mindy Thompson Fullilove, Root Shock: How Tearing Up City Neighborhoods Hurts America, and What We Can Do About It (New York: Ballantine, 2004). Whether or not one endorsed urban renewal policy, everyone was left with the impression that black communities could be leveled to the ground at a moment’s notice. Here I am referencing broken windows policing. For an excellent review of recent scholarship on broken windows see, Jordan T. Camp and Christina Heatherton ed. Policing the Planet, Why the Policing Crisis Led to Black Lives Matter (London: Verso Books, 2017). If there was any doubt about the virulence of colonial machismo or its inoculation in U.S.-American white, supremacist masculinity, one need only look at how recent murders rely on three of its most recognizable tropes – the hunter, the gunsman, the police – that have turned decidedly murderous and terroristic against animals, women, kids, and people of color, particularly African Americans. To say there is an epidemic of toxic masculinity in U.S.A, the world’s leading gun phallocracy, is to say the least. Week after week, we read about police officers as the lawless hitmen of Order (Ray Tensing, Brian Encinia, Darren Wilson et al), the rampage killer (Dylann Roof, John Russell Houser), and the animal torturer and killer (Walter Palmer). These men are getting their fifteen minutes of shame as they are caught in flagrante delicto but their capture or release only begins to tell many stories yet untold. The news isn’t so much that these murders are happening or would continue to happen. It isn’t even that the system is corrupt. We already know that. What is striking about their recent social media exposé is the sense of public outrage at discovering them, and learning how widespread they are. To murder is to end another’s life or the conditions of possibility for life. It is to force the other to die, whether instantly or slowly and unbearably, by force or self-destruction, and then to perversely care that that death is justified in rational, economic or procedural terms. It is to disregard life itself and to strip away everything that constitutes a person’s humanity. For those whose lives are severely disenfranchised by systemic racism, compulsory heterosexuality, and cisgender privilege, historic and quotidian versions of this murder are all too common. But to see through the eyes of the dead, the eyes of Trayvon Martin, Michael Brown, Walter Scott, Sandra Bland and Sam Dubose, is to see these murders (literally and figuratively) as simultaneously uncontrollable and targeted. It is to see the workings of a toxic, supremacist white masculinity as ordinary and terrifying, self-centered and godlike in complex, cowardly and frightful in constitution. There is a silver lining even in this extreme violence. That these murderers would now grab the headlines as murderers indicates that the seemingly unimpeachable white masculinist complex is finally losing its absolute legitimacy, and subject to public scrutiny and judgment. The much bigger problem about the gun phallocracy is the internalization of colonial machismo in U.S.-American psychic, institutional, regulatory and relational structures. 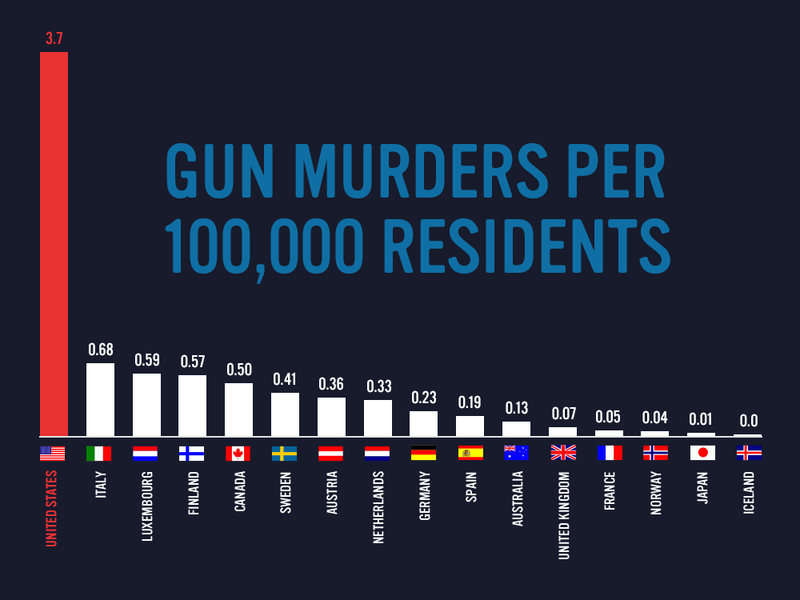 There is more to do than catching or shaming a few of its murderers – U.S. gun violence is the worst in the world. 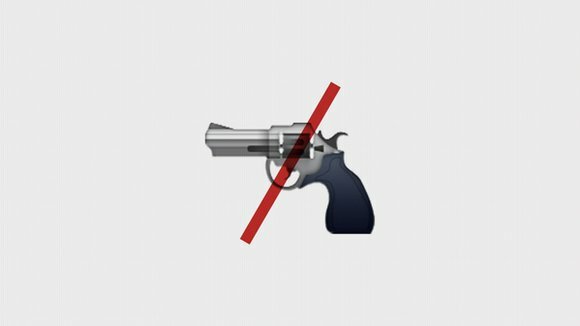 Even though common sense gun laws significantly lower self-inflicted as well as homicidal violence, such studies advocating evidence-based gun safety are often successfully discredited by the gun lobby and the National Rifle Association. Much of this has to do with money, money that is also going into the militarization of the police as an apparatus of the neoliberal state. This includes university campus police units that are increasingly outfitted with the same militarized gear such as those at the University of California campuses during the crackdown against student protestors in 2011. 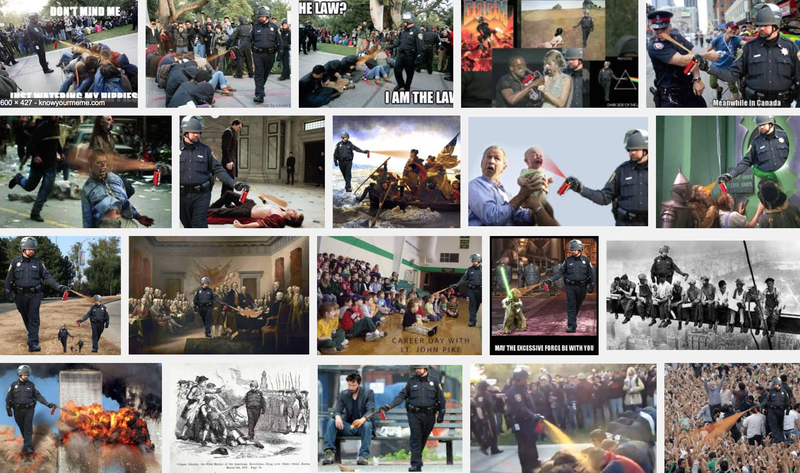 In particular, the pepper spray cop at UC Davis who casually assaulted student Occupy protestors became emblematic of cavalier, campus corporatization rising in tandem with a militarized police presence that is not only out of line but rewarded for their transgressions. For instance, the aforementioned cop was awarded $38,000 for the “emotional suffering” and “psychological injuries” he endured for pulling the trigger of his pepper spray can on 21 students. His notoriety was so widespread that memes ridiculing him and the morally bankrupt decision of the court’s disability settlement saturated the internet. In spite of the public outcry, there is little reform in the police force or cutback from its brutal militarization. One could say that the unmitigated violation of students and their rights by the militarized cops on the campuses of California in 2011 abetted University of Cincinnati police officer, Ray Tensing’s violent extraction of Sam Dubose’s civil and human rights with a fatal gunshot in 2015. Both cops casually or involuntarily clicked on the triggers provided to them by the neoliberal state but it took four years and hundreds of other violations before any misbehaving cop was even deemed potentially criminal. Meanwhile, civilian gun stock per capita has roughly doubled since 1968, from one gun per every two persons to one gun per person. The proliferation of guns has made the industry a powerful, profiteering bloc that is worth 31.8 billion dollars in 2012. Its initiads have more than the defense of the Second Amendment in mind when they do gun talk. The mean salary of a gun worker is $140k/annum (compare that with university pepper spray cop’s 120k/annum salary, which is well above what most professors make). But on the topic of money, what does gun violence really cost? The human toll and direct and indirect costs of gun violence are estimated to be 229 billion dollars. It does not even make economic sense to support the gun industry considering its costs. As the above video shows, this negative economic burden exceeds even Apple’s worldwide revenue in 2012. Who, one might ask, are the benefactors of this gun regime? 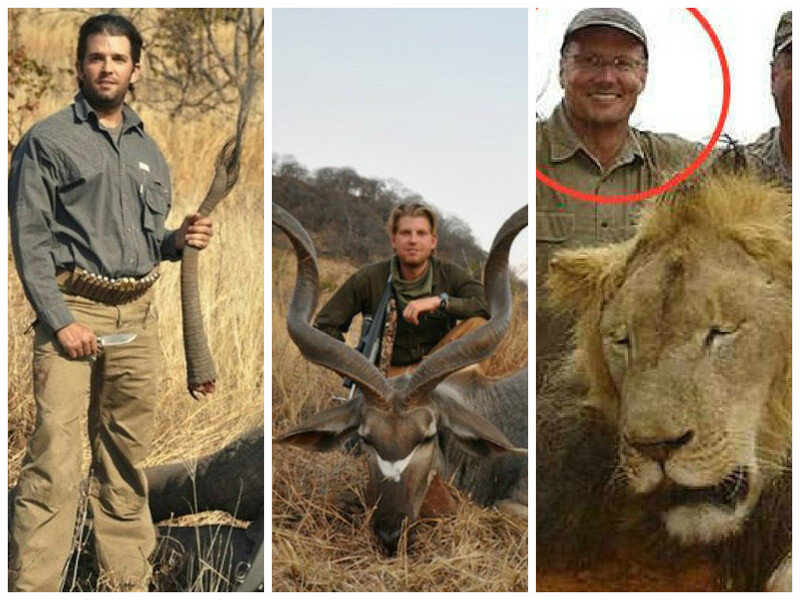 Donald Trump Jr, Eric Trump and Walter Palmer with their exotic, trophy kills in Africa. These kills are allegories of colonial violence in the transnational present. To go after Palmer as a lone ranger is therefore to miss how the colonial hunting of African animals is part of a triumvirate of self- and system-justifying U.S. hunters, mass killers and police on the prowl for blood. These men are duly weaponized and ever ready to boost their frightened manhoods by hunting, hurting and hitting. For who would kill for sport, be triggered by imagined racial assault, and assert the law to shore up the schizophrenia of this unholy trinity? Who else but those threatened by the disappearance of their own relevance and entitlement, their bitterness at the myriad failures of compulsory heterosexuality, and structural inequities biting them back in their asses? No law will change colonial machismo or the imperial white, male ego purchased with blood. For every Palmer, Roof and Tensing caught in the act, many others like them will continue to roam the streets under the radar. What, then, is to be done? Do we need more bodycams, more surveillance, and even more overwhelming evidence of excessive force to indict the bad apples of the state apparatus? Do we need more laws that are enforced by the lawless? Or do we need to dismantle the gun phallocracy by incinerating those damn guns and all macho b.s? “Why are you trying to make sense with crooks?” my dad asked me as the rogue movers from New Jersey held my things in hostage, and demanded twice, three times and finally quadruple the price of the original quote. Each phone call from the company sent me to the nearest town on my drive to Michigan where I had to wire them the money through Western Union. A few weeks later, as they dropped off my things, much of them broken, the movers acted like nothing bad had happened. I kicked myself for going with the lowest bidder but money was tight and the contract seemed binding. There was apparently no legal recourse because the move crossed several state lines, and all I could do was file a complaint with Better Business Bureau and write a really bad Yelp review. As with all good scams, the moving company staged such a flawless execution that fooled even my ex-boyfriend, an attorney in New York City who negotiated on my behalf only to turn on me for not paying them enough as if their quote was my fault. His indictment – “how could you? why didn’t you pay them more” – reverberated in my ear with resonances of our recent break-up. Months later, an exposé news team did a segment on moving scams and shamed this rogue company on national television. It was unreal to see the company on TV. I felt vindicated though not much better. I was reminded of being attached to broken things. Besides, the corrective justice focused on one company out of thousands that used predatory and extortionist practices. For instance, over 8500 complaints were filed in 2012, and many more hoaxes go unreported. What does it take for institutions to take action? What the news segment did was to confirm my account all along but the power of televisual validation turned the tide against the rogue mover, which closed down. A year later, it morphed into another company. Are the recent exposés of U.S.-American policing doing something similar or different? Are the cams making visible what has been concealed or are we simply refusing to see the actuality of lived violations? 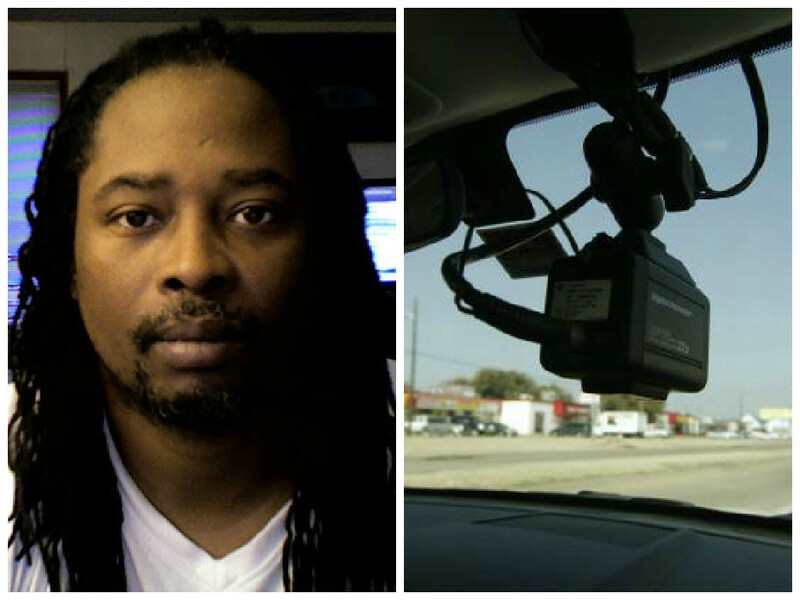 The eyes of Sam Dubose, and the dash cam of the Dallas police. Who’s looking – the eyes of the dead or the colonial gaze? As a window to the street scene of policing, the cam’s realistic frame is entrapped in the engendering of illusion, and its interlocutors have used its recordings as a matter of representation, or the truth, rather than as a resource for a direct changeover from representation to commentary. What the camera is demonstrating is the method of murderous policing coming undone because its agents are unable to contain the virulence of the racist and misogynist state. They are acting on its deadly colonial machismo as if its labile affects are beyond control. And they are out of control. In the latest murder case, University of Cincinnati police officer Ray Tensing moved from monotonous flatness one moment to compulsive rage the next before blowing the face off Sam Dubose with one shot. Dubose is the 534th person shot dead by the police in the U.S. this year. Tensing joins a long line of angry white men who “lost their temper” at being disobeyed or disrespected, and then immediately pulled out their guns for self-protection. If ever there was a need for trigger warning, this is it. “Man is never cruel and unjust with impunity: the anxiety which grows in the minds of those who abuse power often takes the form of imaginary terrors and demented obsessions. The master maltreated his slave, but feared his hatred. He treated him like a beast of burden but dreaded the occult powers which he imputed to him. And the greater the subjugation of the Black, the more he inspired fear; the ubiquitous fear which shows in the records of the period and which solidified in the obsessions with poison, which throughout the eighteenth century, was the cause of so many atrocities.” (New York: Schocken, 1972), p15. The U.S. obsession with guns in the twenty first century substitutes for the colonial obsession with poison of the eighteenth century, and both are tied to the “anxiety… of those who abuse power.” Each murder in the U.S. gun phallocracy continues the atrocities of colonial violence. The falsehoods and fabrications of the police in their reports of murder echo the “imaginary terrors and demented obsessions” of the slave master. Ferguson police officer Darren Wilson, for instance, characterized Michael Brown as a “demon,” and said he “felt like a five-year-old holding Hulk Hogan” even though both men were 6 ft 4. Perhaps Wilson is articulating a nation’s anxiety at being coddled by a black President or perhaps he is so shaken by the broken spell of colonial machismo that he has to murder to make the spell work again. Either way, the toxicity of white, supremacist masculinity has become an extremely dangerous contagion, and is in desperate need of medical, social and rehabilitative treatment. May the ghosts of the dead rise up to forever haunt all deadly white man, the hunter, the gunsman, the police, and their imitators with their smoking guns in hand every minute of their waking days. Can the subaltern speak? No, but she can certainly sob, with cries of raking loss and, a few rapid film cuts later, tears of heartwarming gratitude. I learned that much watching Kony 2012 this morning, even if, like most people from the region, I learned little else by way of information or context. Why did I wait so long to actually watch the film I’d been stewing about for the last week? I actually started to watch once, but was foiled by a bad Internet connection and the off-putting opening sequence (which resembles an ad for Facebook or Google more than a documentary about Uganda). And in a way, these obstacles told me something. I am not the target audience for this film. American youth with ubiquitous, high speed internet access willing to watch 30 minute films on computer screens, cell phones and (probably soon?) wristwatches are. But my exclusion from the film’s emotional community isn’t about age or tech savvy, but because I’m an African who happens to be neither a victim nor a villain, and simply doesn’t fit into either the audience or the subject matter of this overnight, worldwide success. If I had to sum up our bad attitude it would be thus: We feel like the vision of the world acting in unison extolled in the film Kony 2012 doesn’t include us. After all, the film tells its viewers that no one knew or cared about the Lord’s Resistance Army before three twentysomethings from California stumbled upon some terrorized children sleeping outdoors. 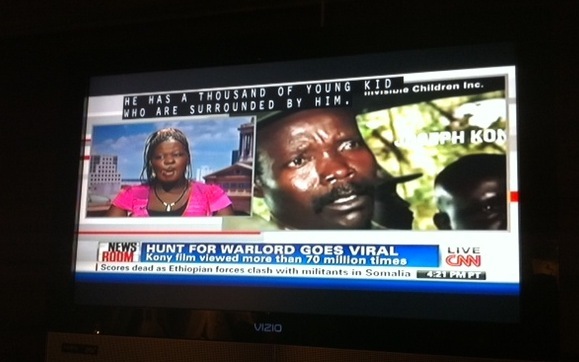 Kony 2012 doesn’t imply that Kony is still in Uganda, as some critics have claimed. But it does recycle powerful but outdated imagery from their earlier films about Northern Uganda. It does make exaggerated claims for the leading role of Invisible Children in the peacemaking and post-conflict process (taking full credit, for instance, for the recent deployment of 100 US military advisors to Uganda). And it does assert that only continued US intervention now — compelled by a worldwide youthful grassroots mobilization — can end the regional conflict by “arresting” Kony. But its not the questionable geopolitical analysis of the film that gets to me so much as its affect. Those who haven’t been able to bear the thought of watching it really should make themselves, if only to grapple with the escalating power of images to affect us. It is that power that makes the informed, learned critiques irrelevant, as both the filmmakers and Noam Cohen in today’s New York Times make clear. Cohen casts this irrelevance in the familiar frame of obscure complexity versus compelling simplicity. But the truth is that emotions can be as complex as ideas. 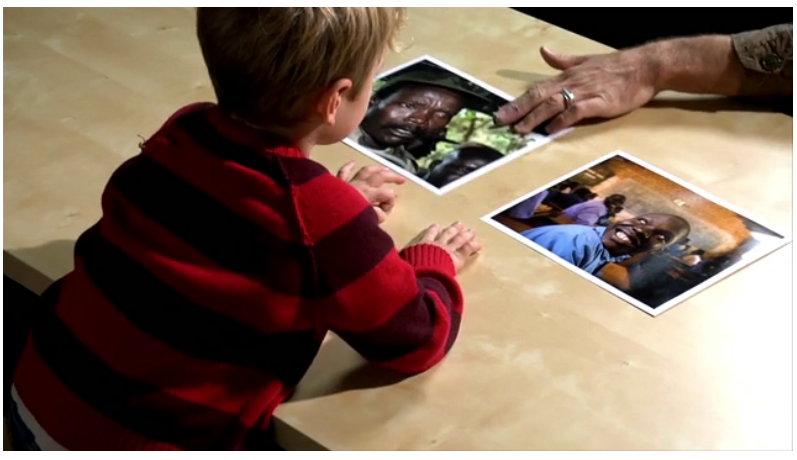 And it took Invisible Children, Inc. years to craft the sophisticated images and participatory campaigns they have mobilized, as a viewing of the evolution of their prior efforts shows. Simplicity has nothing to do with it. So, while I do have an informed, professional response to the claims made by Kony 2012, but that response is short circuited by my feelings at seeing East and Central Africa explained by showing two mugshots to an adorable blond boy from San Diego: a good African victim and a bad African warlord. The film expects its audience to identify with the little blond boy. Indeed, it obliges it to. Africans however, must identify with those flat images on the table. With Jacob Acaye the former child soldier, yes, but with Joseph Kony too. We know that these are two side of a single coin, and that when we are seen as the one, the face of the other is always lurking beneath. Still, once I finished watching the film I abandoned self pity and ressentiment. This is a trap for the contemporary African subject. After all, we are wired into the same communications networks and feedback loops of emotional intensity as everyone else. We are no longer colonial mimics, calculating how best to reflect back Western ideas and images for our own ends. We are now all neoliberal perverts, in the sense of perversion developed by the critic Slavoj Zizek, perversion as the “inverted effect of the phantasy.” Sounds “complicated” and maybe it is. * But insofar as films like Kony 2012 invite us to see ourselves in the gaunt visage of a horror film monster like Joseph Kony — who acts at the direction of no cause, not even his own, but at the command of the Lord — and then to reflect back that image in a bizarre, pseudo-Situationist campaign to emblazon his name and image everywhere, from streetlamps and public monuments to our laptops, cellphones and bodies, I think we get the point. The objective today is not to give Africa it’s voice but to traverse and escape the fantasy that “voice” can endow us with agency in a society controlled by the imperatives of war and capital. * For those interested, I develop an account of perversity in the global circuits of vicarious participation in Africa’s crises in this forthcoming article (you can read uncorrected page proofs here). There’s a new Volkswagen ad in which a child dressed as Darth Vader tries to use “The Force” to control objects in the world. then you see that dad has secretly started it with a remote-control device, validating the child’s belief in his own super powers. This is a classic postmodern ad in that the viewer is shown exactly how the trick is played but made to believe it anyway. that what’s being sold as magical omnipotence is just the ability to start a car with a button instead of a key. while systematically stripping them of any real agency and political power. Go to work. Buy a new car. You’re a superhero! Of course I’m not suggesting a fine company like Volkswagen could now have or could ever have had anything to do with fascism! But there is another side of this. What makes the ad work is its psychological validity. Unless parents serve their children’s sense of magical omnipotence, their kids will be pathologically depressed at best, or simply dead. precedes, is necessary to, and continues to underlie the acquisition of actual agency and power– the alternative is learned helplessness. Given these two opposed perspectives, how can we think through this? Even if you consider the ad a trivial matter, the contradiction is stark and the stakes seem pretty high. 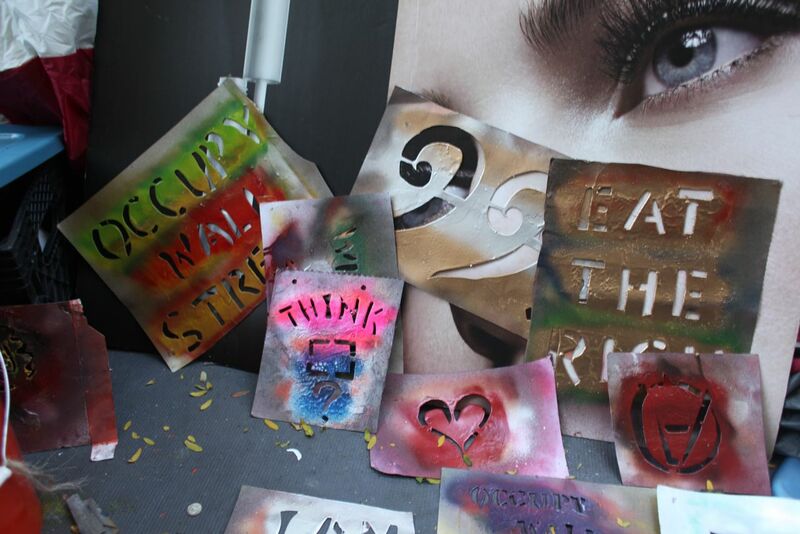 To take the question to another register: do Occupy Wall Street and related actions empower people? part of some systemic damage control mechanism that offers aesthetic or symbolic shows at the expense of real political mobilization? As if the revolution were a car and O.W.S. the remote control device that will turn it on? that this is just an infantile display, that we are clutching at straws, that no sustained movement can come from it. In the face of contradiction, or even just because it’s early days, how can they be so sure? What makes these little Darth Vaders pretend to knowledge that one couldn’t possibly have at this stage? The anxiety comes from “being implicated,” from being “at stake in the game”– as it seems to me we are all at stake here. all of what Occupy Wall Street defies. A famous prayer asks for courage, serenity, and “the wisdom always to know the difference” between what can be changed and what can’t. Better pray instead for the folly not to know the difference! What if politics– what if the world– did not work exactly as we know? so that we could not necessarily predict how events in one realm might reverberate in another? What if the Flap of a Butterfly’s Wings in Brazil could Set Off a Tornado in Texas? What if a mathematician’s algorithms could trigger a stock-market collapse? What if tiny, hyperlocalized genetic mutations could, through a process of natural selection, lead to collective evolution? Wouldn’t that be incredibly weird? whether it be the economy, the academy, the family, identity, theory? And what if these resonances are real and contagious? succeed in imposing the rhythm of their own vibrations”? 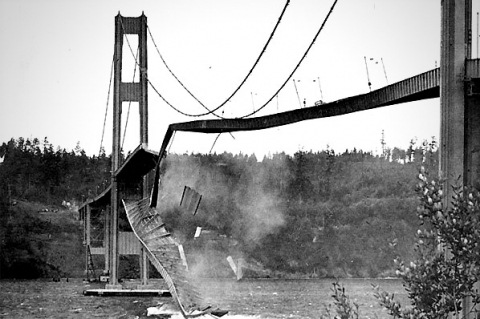 What if what we consider solid realities– like bridges of steel and concrete– could one fine day begin to undulate and break apart? we could gain more leverage not by asserting knowledge but by persistently asking questions (as that song famously does)? designed to expose their presumption to knowledge they could not possibly have? 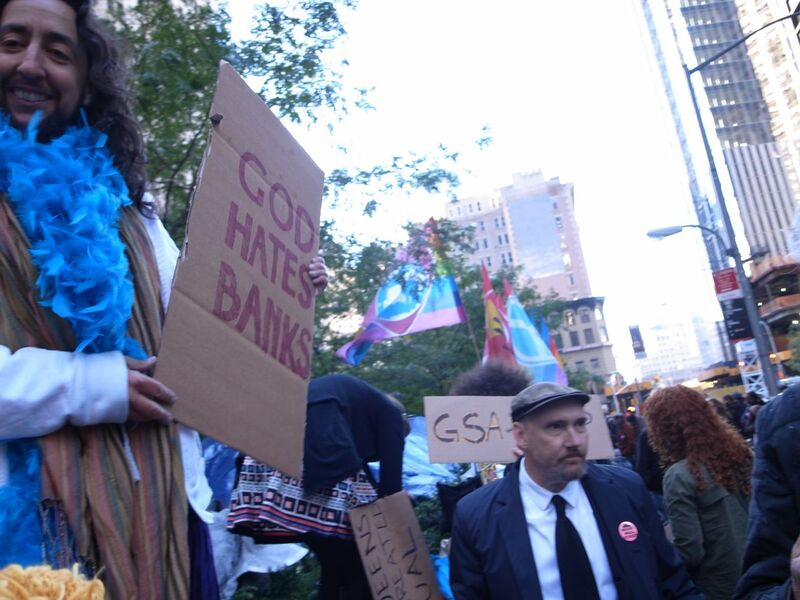 Occupy Wall Street has never suffered from a lack of rational plans and proposals, as some allege. Here’s some for you: progressive taxes, financial regulation, health care, jobs, socialism. Take your pick. I have more. part of what Raymond Williams called a “structure of feeling.” This is part of what OWS is helping to discover, to invent. Assorted already-existing emotional coherences are available, of course. which comes from more privilege– more wounded sense of right and dignity– than most of those present possess. “the master’s tools will never dismantle the master’s house.” But this is not only a matter of tools, of instrumental strategies. are so hobbling, corrosive and suffocating as to make the reality of neoliberal late capitalism uninhabitable. When you can’t inhabit it, occupy it! there is at least– a vitality. Of course, I have to point out, you can’t recognize constructive politics by vitality alone. something about the aliveness and emotional intensity captured by Nazism. Much of the work of politics is affective labor, the work of translating vitality into a stance. a combination mostly unthinkable today. But I bring this up not at all to say those were the days. In any case, fascism remains and will remain one of the ongoing tendencies of capitalism, and not only as a distant spectre. what about the demagogues, scapegoating, symbolic and perpetual wars we already have? the dark energy pushing all of us apart? that resonate only faintly, sparks that crackle and wink out, glowing embers that never burst into flame? Would that warmth be enough to sustain us? In the interests of full disclosure, let me acknowledge where I’m coming from: I’m a writer. It’s an interesting moment for me. The presidency of George W. Bush, as you may be aware, was also a nightmare for anyone who cares about language. Language itself seemed to be in the process of being continually, systematically evacuated of meaning and life. After that, to hear Obama speak with intelligence and presence– even with precise grammar– could bring tears to my eyes. and the intellectuals I have heard speak there seem somewhat out of their element too. like Hitler or Mussolini should be haranguing the crowd from a balcony. You really want a unified public sphere? more like writing, a process of reaching for what wants to be said but is not yet possible to say. You there, with your head bent down! Why are you mumbling inarticulately to yourself? I am one of those traitors to my species that serve the entity known as language. That’s the extreme version, anyway. or even more simply, what if a text makes no claim at all but the bare fact of its aliveness in the moment of its being written and read? So what is it, over all the conversations at Occupy Wall Street, under them all, behind them all, running through them all? THE FUNCTION OF LANGUAGE IS NOT TO INFORM BUT TO INVOKE. WHAT CONSTITUTES ME AS A SUBJECT IS MY QUESTION.